The CruzPac Mid-Size Touring Motorcycle Trunk - Our CruzPac is 100% hand made in our shop by us. From waxing the molds that we designed and built, spraying gelcoat to 40 mils, spraying neutral gel & polyester resin to another 80 mils, hand laying and pressing 35 square feet of 1.5 oz fiberglass mat, installing OSB in the lower layers of the bottom for strength, laying additional reinforcements in the hinge, latch, and top areas, cutting & trimming, sanding, fitting, painting and/or buffing, hand drilling and fitting all 100+ pieces of hardware, laying interior carpet, and finally assembling these units...all a very tedious labor of love. Dimensions... The CruzPac is our mid-size touring pack and was originally designed several years ago to emulate the approximate size of the HD Heritage Classic leather pack, but a little taller to allow the storage of a full coverage helmet & jacket. The CruzPac measures approx. 17-1/2" wide at the front and 15-1/2" wide at the rear, 11-1/4" tall at the front and 9-3/4" tall at the rear, and 14.5" front-to-back. It was designed from scratch for mid-size cruisers, to provide large touring pack capability without being overwhelming in size, and has been installed on tons of Sportsters and bikes under 80 c.i. 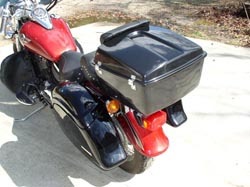 It has an optional backrest, the same pad as seen on the Demon in the photos. You can put a full size helmet, jacket, etc in it AND close the lid! What makes us different? Unlike most everything else on the market that is plastic, ABS, or heavy Chopper Gun fiberglass, the Demon we manufacture is all hand laid and pressed glass, OSB reinforced flat bottom (no need for the H-D bottom plate inside). 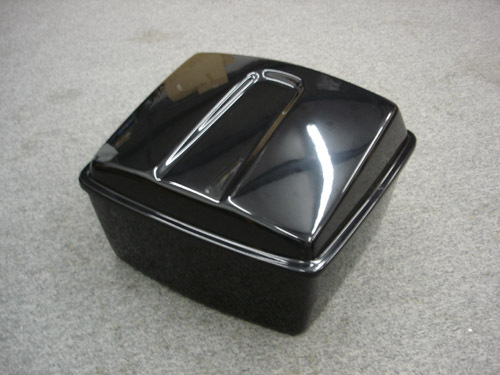 These aren't the cookie cutter plastic stuff seen everywhere, they are each built to order for the customer, with the specific options and features you want. We also do a lot of "one off" pieces for people, so don't be afraid to ask if you have a special request! 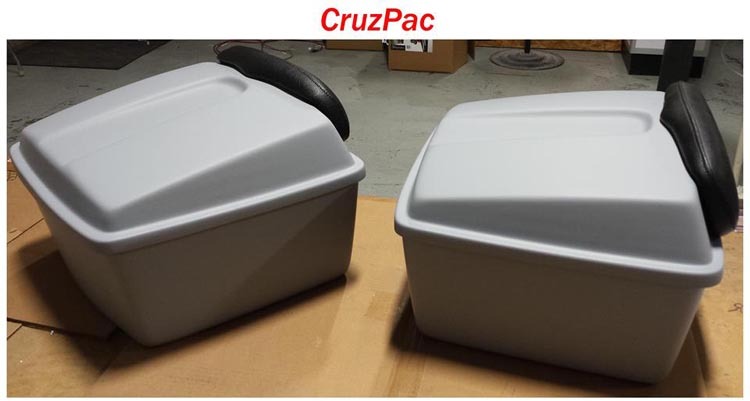 We typically prefer to deal with our CruzPac customers on a one-on-one basis, to get every detail of our custom fabrication and assembly of these perfect. Email us at sales@621cycles.com to discuss your needs, and be sure to check out daily build pictures and loads of customer installations on our facebook page at: facebook.com/621cycles .